Karol L. Chaves, 71, of Elk Mound, WI passed away on Monday, January 21, 2019 at Mayo Clinic Health Systems – Eau Claire. Karol was born on December 21, 1947 to Kenneth and Ione (Goss) Lanphere in Eau Claire, WI. 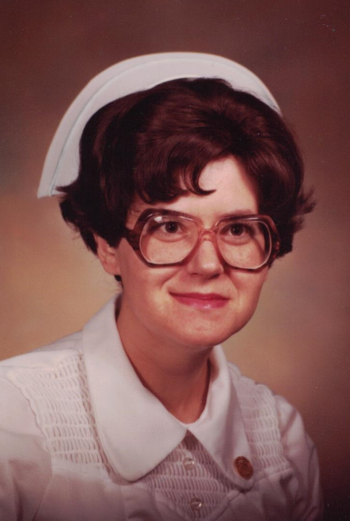 She received bachelor’s degrees in Nursing and Police Science and worked as an LPN from 1977 until retiring in 2010. Karol adored spending time with her family, especially at get togethers and holiday gatherings. She enjoyed singing and loved to listen to country music. She was an avid card player and always made sure to watch her favorite TV shows; MASH, Golden Girls, and various gameshows. Karol is survived by her husband of 40 years, Juan Carlos Chaves; her children: Rick (Stephanie) LaRock, Lori (Andy) Hewitt, and Tony (Michelle Brassfield) LaRock; grandchildren: Heather (Stephen) Allen, Jocelyn (Tony) Stanton, Matthew LaRock, Derek LaRock, Elizabeth Fleming, Tessa Dutton, Sami Dutton, Blake Patneaude-LaRock, Noah Sobottka, and Jenna LaRock; great grandchildren, Kayliegh Stanton and Shawn Allen; Brothers, Jim (Vicky) Lanphere, John (Deb) Lanphere, Daryl Lanphere; and sister-in-law, Christi Lanphere; as well as many nieces, nephews, cousins, aunts, and uncles. She was proceeded in death by her parents, Ken Lanphere and Ione Bosher; brother, Dale Lanphere; and sisters-in-law, Julie Lanphere and Cheryl Lanphere. Memorial services will be held on Saturday, February 2, 2019 at 12:00 pm at Concordia Lutheran Church with Pastor Aaron Hamilton officiating. Visitation will be from 10:00 a.m. until the time of services at church on Saturday. Burial will take place at a later date at the Union Cemetery in Cleghorn. Family and friends may leave condolences online at www.smithfuneralec.com. May your heart and soul find peace and comfort. Peace, Prayers and Blessings, Wishing you peace to bring comfort, courage to face the days ahead and loving memories to forever hold in your hearts. May you be comforted by the outpouring of love surrounding you. I will miss you Karol. So sorry for your loss. May you be blessed with the Lord’s love. She will be missed by so many. Going to miss that twinkle in your eye, and that smile on your face, when I walk into the room with my Guitar to sing you a song. So many treasured memories of all you have done. Love you with all my heart and soul Karol, you will forever live with in my heart. So sad for your loss.Please know your in our thought at this time of sorrow. Loved her and will miss her! Know she is with loved ones, entertained by Mike W. Family are in my thoughts n prayers. Our deepest condolences for your loss. May she await you with her loving heart until your forever reunion. Juan, I’m saddened to read of Karol’s Karol’s passing on to her eternal life. Karol always had a smile and kind word, whenever I saw her. It has been a while since we seen each other. May you feel comfort in God’s presence and in memories. I’m so saddened to hear of your loss Juan Carlos. I pray for your comfort and future. We all miss you. Karol was a wonderful woman who was kind and caring to everyone. She will be deeply missed. Rip dear Karol. Prayers to the family. We are deeply sorry for your loss.We pray for her soul and ask God to bless you all. I’m very sorry for your loss. May she Rest In Peace and you. Juan Carlos, May you and the rest of the family find the comfort you need in these difficult moments. She will be missed!!! May the Lord keep her in her rightful place in Heaven! May God comfort and keep you in His care now and always. We were best friends in our growing up years and she remained in my heart all that time and memories never end. We will meet again in Heaven.